There a few thing's about the Winter months that are inevitable, one of those thing's being dry skin. I've tried several brands of lotions & creams, and though they might be wonderful for other Seasons, none of them seem to help me battle the bouts of severe dry skin that the winter brings. So, this year I went in search of a lotion or cream that would alleviate the issue, and what I found was an awesome brand called Udderly Smooth! Originally formulated for cows, I didn't know what to expect. Would it smell nice? Would it really do the trick? Yes, and YES! To my surprise the lotions & creams have a fabulous light barely there scent, and are unlike anything I've ever tried! They are easily absorbed, and incredibly long lasting. I was most shocked by two things. The first being the fact that my nails were growing so rapidly and are stronger than they have EVER been. Two, the foot cream instantly made feet as baby smooth as they have EVER been. Normally after a couple of cold snaps in the winter, resulting in a few days indoors in the dry heat, I'll start to see some issues with my skin....NOT this year! I have had smooth skin all season so far, this is bar far one of my new FAVORITE moisturizer brands! A DEFINITE MUST HAVE for the Winter Months! Try it and get Udderly Smooth! One Lucky Reader will receive an Udderly Smooth Prize Pack! 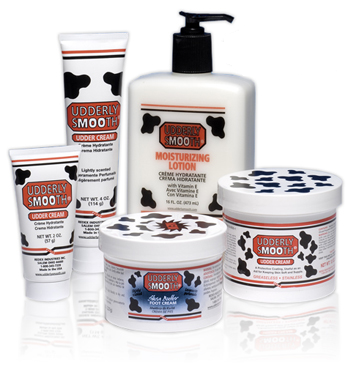 Leave a comment~ Visit http://www.udderlysmooth.com/ and let me know what Udderly Smooth Products you'd love to try! The comment is considered your entry. Pack @savvycouponmom http://bit.ly/dIHRzU #Giveaway #WinterWonderful (can be repeated twice daily for additional entries~ copy paste please~cut and paste- the bit link must be posted in the tweet - I will check) (Additional 5 Entries - 5 Comments). I need some moisturizing lotion for sure! Looks great! I really want to try the foot cream with shea butter as my feet have been terribly dry this winter. The foot cream looks amazing! I would like to try the foot creme with shea butter.